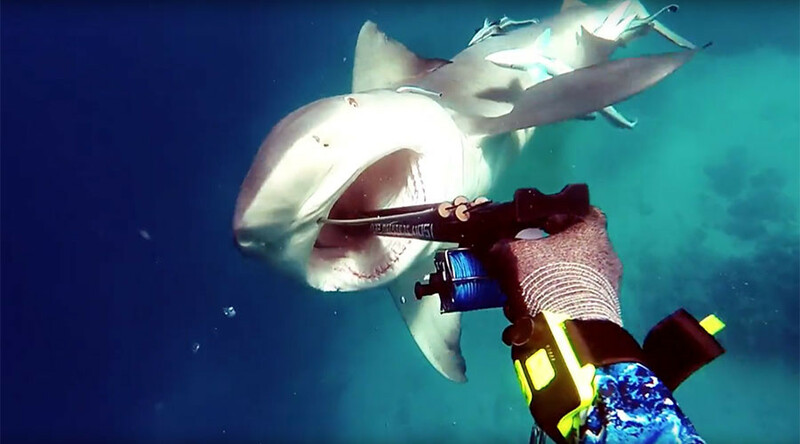 A no-fear fisherman managed to ward off a shark using his spear gun while fishing off the coast of Queensland, Australia. Kerry Daniel captured the moment a bull shark lunged at him from the depths below in what could have been a fatal attack. Daniel, a spear fisherman, was fishing in a channel when he saw the bull shark bolt towards him from 50 meters below. He expected a mere bump from the dangerous shark, but in the last six meters he realized that the shark intended to harm him. Using his speargun, Daniel shot the shark in the mouth as it came close. He then grappled with it for a while, but when he realized the spear was stuck in the shark’s mouth, he rather cleverly abandoned his equipment. “We’ve had reef sharks come up to us before, they might take a fish off your line after you shoot it, but nothing like this,” he added. Daniel said he does not know what became of the shark, which was last seen writhing around in pain with blood gushing from its mouth from an impaled spear. He can only hope that next time he’s fishing he doesn’t encounter a shark with revenge on its mind.